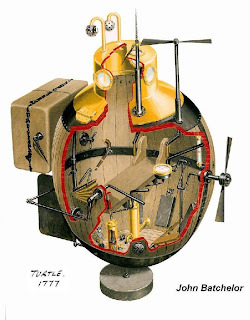 David Bushnell's 1776 invention, the American Turtle. 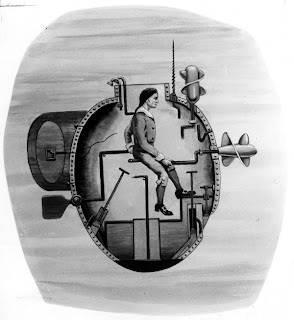 The first submarine ever to be used in combat was actually constructed as an afterthought. 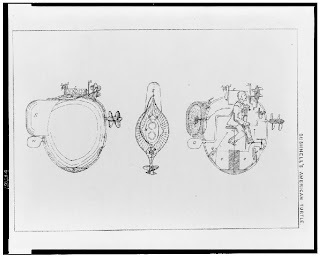 Bushnell and fellow Yale University intellectual, Phineas Pratt, had conceived of the underwater bomb with a time delayed flintlock detonator. The one-man, hand-propelled submarine was designed simply to transport the bomb to the enemy vessel. The American Turtle was successfully launched in the dark of night on September 6/7, 1776 against the British flagship, HMS Eagle, a 64 gun frigate moored in New York harbor off of the island now occupied by the Statue of Liberty. 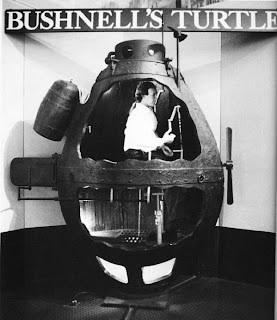 The American Turtle had undergone extensive test trials in the safe colonial waters of the Connecticut River off Old Saybrook, Ct., piloted by the inventor's brother Ezra Bushnell. Unfortunately, on the eve of the submarine's first combat mission, Ezra Bushnell died. 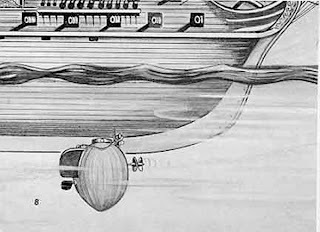 With a freshly recruited, but less practiced pilot, Ezra Lee of Old Lyme, Ct., the American Turtle made its way underwater to the rudder of the Eagle's hull. Unfortunately, Lee first struck metal rather than wood with the screw intended to attach the bomb to the enemy's hull. After a second failed attempt, Lee propelled the American Turtle away, only to be observed and chased. The bomb was released into the water and resulted in a frightening explosion. While the American Turtle failed to destroy its target, the British recognized the threat and moved the fleet. Weather problems, and other operating difficulties prevented a successful attack by the submarine before it was scuttled by the British while being transported. A man hunkered inside a replica of a Revolutionary War submarine was arrested Friday, 3 August 2008 after police found the strange-looking vessel partly submerged in a security zone near the docked Queen Mary 2. 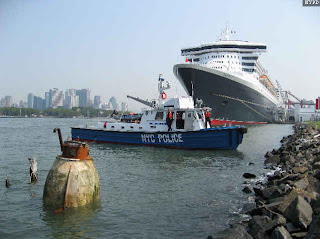 The vessel and an inflatable boat were spotted by police near the luxury ocean liner docked at the cruise ship terminal in Red Hook, Brooklyn. Police arrested three men. New York City Police Commissioner Ray Kelly said the submarine did not represent a terror threat, but was "the creative craft of three adventuresome individuals." The brown, egg-shaped wooden vessel, known as a "turtle submarine," is a replica of a submarine American Turtle used during the American Revolution, said Coast Guard Petty Officer Angelia Rorison. 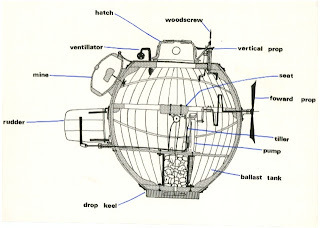 It looks like a diving bell, with a hatch on top, and is about 8 feet long and 4 feet wide. It is propelled by a pedal-operated paddle. The Coast Guard issued two citations to Philip Riley, 35, of Brooklyn, who was inside the vessel, Rorison said. "Basically, the vessel was not safe to sail. It had no lights, no flares. It was not registered," she said. "Instead of safety violations, this could have turned into a search and rescue." The investigation began after a New York police detective noticed the sub and the raft and summoned the Harbor Unit. Rorison said all three men were taken in for questioning by the NYPD. "While our ongoing investigation has so far yielded no suspicious devices or materials other than the vessel itself, NYPD detectives will extensively examine Queen Mary 2 to ensure its integrity," said Kelly. "The three individuals believed responsible are in custody and may face various charges. Meanwhile we can summarize today's incident as marine mischief."